In the Anishnabe language, Kebaouek means “at the narrows beyond which more water opens out”. Local elders say the term applies to all of Lake Kipawa, and refers to its many hidden arms and bays. What is now called the Kipawa River, runs through much of the traditional territory of what are now the Wolf Lake and Eagle Village First Nations. From its head waters at Matawashkwia Sagahigan (Grassy Lake), the river flows westward Mahingan Sagahigan (Wolf Lake), then southward through Minitigagook Sagahigan (Brennan Lake or Lac Sairs) and westward to Lake Kipawa.. According to the Elders, however, only the final stretch of water leading to Lake Temiscaming can properly be called the Kipawa River. The other sections have many different names. For example, the stretch from Grassey Lake to Watson Lake is called Matawashkwia sipi. And the long stretch from Wolf Lake to Lac Sairs is called Witigowiak sipi. Along this river route are the rema\ins of numerous abandoned logging camps from the nineteenth and early twentieth centuries, complete with stump and rusting machinery. The red and white pine of the Kipawa region were among the last of the great forests of the Ottawa Valley to be cut over, and they provided lucrative returns for many decades to lumber merchants from Pembroke, Renfrew and Ottawa. The main access point for the Kipawa River is at the south end of Wolf Lake. 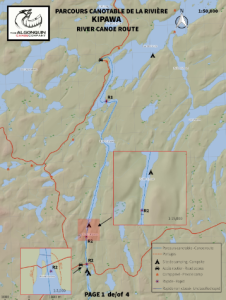 Algonquin Canoe Company can provide a drop off and pick up service for this route, the drive takes about 3 hours from Temiscaming, Quebec (time may vary depending on road or weather conditions). There is a campsite at the drop off point; however a nicer beach campsite can be found on the other side of Wolf Lake –about a 2km paddle. After a short paddle down Wolf Lake, the entrance to Kipawa River will be on your left. The river starts off with 3 straightforward R1s. The first large set of the river passes under a bridge (the second access point to the Kipawa River). The portage takeout is located on river left and the bridge is an ideal location for scouting the set. The set is an R2 with two channels. The right channel has smaller water but is more technical, while the left channel has larger waves. There are two campsites located right after the bridge. The second campsite (on river left) is the nicer of the two. There is deep water ideal for swimming and you can paddle out into the current by the campsites for good fishing. This is the hardest day of the trip, with bigger whitewater and more portages. All sets in this section have the option of portaging around them and it is very highly recommended that Elliot’s Rapid and Turner Falls are portaged. The three sets that can be paddled are technical R2s. Portage trails should be used to scout since often the whole set cannot be seen from the top. There are two campsites located on the Turner Falls portage. The better campsite is located slightly off trail at the base of the falls. This campsite is the best viewpoint for Turner falls and it is definitely worthwhile to at least stop by for the view. This is more of a relaxed day. However winds can pick up on wider sections of the Kipawa River and on Lac Brennan. There is one more set after Turner Falls (R2) that has an optional portage on river right. Depending on how much time is available, there are several nice beach campsites at the start of Lac Brennan that are ideal for swimming and fishing. On an island that is 1.5km from the river an old mining site can be found that contains the rare crystal Amazonite. 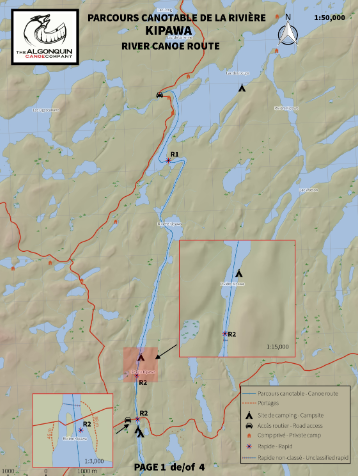 The pickup point is located in Lac Charette, which is accessed by a creek located in the northwest arm of Lac Brennan. The return drive to Temiscaming should take around 2 hours (time may vary depending on road or weather conditions).